Cazadero Music Camp brings the love of music and learning to youth. We provide a nurturing, inspirational environment for young musicians ages 10-18. For more than 60 years, Cazadero has offered a dynamic music education program that strikes a thoughtful balance between in-depth music education and carefree summer camp fun. Caz is set on 33 acres near the Russian River in Sonoma County where young musicians learn together under a canopy of spectacular redwood trees. Our vision is to bring the transformative Caz experience to as many youth as possible. Combining music and nature in a truly unique setting, young musicians develop a love of music which lasts a lifetime. Our impact is evident in the inspired performances that close each session and the heartfelt evaluations of the young musicians themselves. You can read these evaluations on our Caz Testimonials page here. 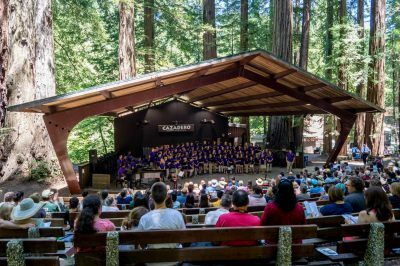 Cazadero inspires over 1,400 youth each year through two complementary music programs, Summer Music Camp, and JumpStart in Music. Our Summer Music Camp brings together a diverse and talented student body from across the Bay Area and beyond. Campers work closely with skilled Conductors, talented Music Faculty, and a devoted Camp Staff. They discover their love of music, develop their musicianship, gain confidence in their playing, and make lasting friendships. Learn more. JumpStart in Music is a low-cost, high-impact weekend version of our Summer Music Camp for school and school district music programs. JumpStart brings Sonoma County and Bay Area public school students, their music teachers and high school mentors together for a three day, condensed immersion program which produces some remarkable results. Learn more.